Do you have a pile of unwanted electronics in your home or office? 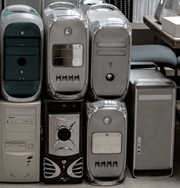 Old computers, computer parts, hard drives, monitors, printers, cables, CDs, software, floppy disks, wires, or unknown, mysterious electronic devices? Want to figure out what to keep and what to throw out? Do you need to retrieve data from an old computer? Jackson's can retrive the files and convert the files to a useable format. Don't know what to do with the old equipment? Do you want to get rid of old computers, but, don't know how/don't have time to erase them? Spring is here, and its time to get rid of unwanted, useless electronic devices! Call Jackson's today and your unwanted stuff will be gone tomorrow!